Aurilux is 100% polyester thread. It is an exceptional thread that possesses all the brilliance of the best rayon, with the benefit of a satin finish endowed with extraordinary depth and luminosity of colour. 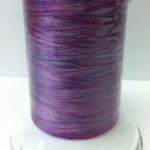 An excellent thread choice for thread painting and art quilts, where the thread needs to make a statement. It is certainly a favourite for machine embroidery. This 36wt Aurilux thread is also recommended for projects that will be subjected to many washings. Each spool contains 1,100 metres of thread. View the Aurilux Polyester colour chart. NEW! Polyester king cones. This new MUST HAVE variegated polyester thread is a 40 wt high-sheen premium trilobal polyester thread, ideal for embroidery, quilting, thread painting and decorative stitching. It’s also beautiful for satin stitching and decorative appliqué. Available in 10 colours.